Wiseman Ndodiphela Calvary busy with his trial sermon. Wiseman was born at Hluleka, Ngqeleni in the Eastern Cape where he grew up and completed his primary school at Mdikane Junior School. Thereafter he went to St Barth’s High School at Qumbu and passed his matric at Gxaba in 1996. His parents and his aunt had a great impact on his life as they always encouraged him to go to church. His Junior Secondary School principal always encouraged him too. My retired minister Rev. WD Stadler played a great role spiritually and supported me to go to high school. His wife and children are precious to him and are his greatest inspiration. In 1986 he became a full member of the then DRCA at Canzibe congregation where he served for some years in youth ministry. Later on he also became active in URCSA’s CYM (Christian Youth Ministry). In his secondary school years he served as one of the leaders of the student Christian movement and was the chairman of the SRC (Student Representative Council) at Gxaba Senior Secondary School. He can be proud of his leadership because during his term there was no strike at school and everything went smoothly. From 1997 to 2008 he worked in the Department of Education as an administrative clerk and later at the Department Sport, Arts and Culture as accounting clerk. Wiseman pursued his calling and went to the University of the Western Cape where he obtained his BTh in 2015. In 2016 he registered for the Post Graduate Diploma in Theology at Stellenbosch University and in 2018 he registered for a Structured Masters in Theology that is equivalent to MDiv. Wiseman’s dream for his future congregation is a united congregation that works as a family, a congregation that welcomes all people so that they can feel welcome and at home. He would like to see how the congregation grows spiritually, numerically and financially. He would like to facilitate workshops on leadership and help with team building. He would also like to identify potential leaders and facilitate Bible studies so that the congregants may grow spiritually. But to be able to be effective he realizes that he will have to learn how his congregation members do things in their context. What makes them to be strong in serving the Lord? How do they manage to survive in the midst of their challenges? Wiseman’s Postgraduate Diploma’s thesis was about “Racism within the URCSA: A serious challenge for living the Belhar Confession” with Prof. R Muller as his supervisor. Prof Muller was also his supervisor for his Master of Theology where his thesis was “The Historical Overview of the reception of Belhar Confession in South Africa and beyond”. 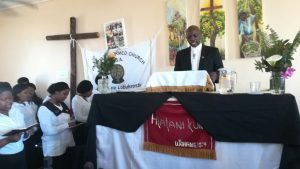 Wiseman’s trial sermon was on 19 August at Canzibe Congregation, Ngqeleni district 40 km from Mthatha. Wiseman is very fond of sport and music.